that turns your dog’s meal into a challenging game. GREEN by NORTHMATE is a specially designed feeder that turns your dog’s meal into a challenging game. GREEN by NORTHMATE prolongs eating time significantly and reduces the risk of gulping and bloat. The result is a happier and healthier dog. GREEN by NORTHMATE is designed for all dogs regardless of weight and breed. It can contain both dry and wet food. 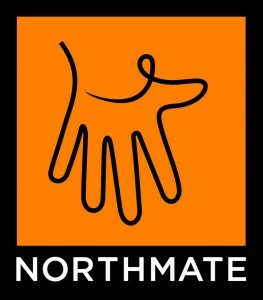 GREEN by NORTHMATE is made of hard plastic (without phthalates) and can therefore be used outside and cleaned in the dishwasher. GREEN was released world wide at the Nürnberg pet fair INTERZOO in May 2012. 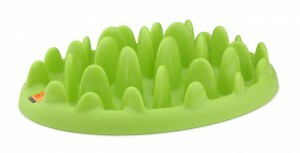 GREEN mini is a one-piece molded feeder of hard phthalate-free plastic. GREEN mini is a one-sized product weighing 400 grams and measuring 29 x 22.5 x 7,3 cm. 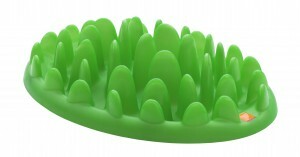 GREEN mini consists of 32 blades of grass – all of them smoothly rounded. GREEN mini has an outer edge allowing wet food and approx. 0.25 liter of water. GREEN mini is available in one color – light green. GREEN mini was released world wide at the Bologna pet fair ZOOMARK in May 2013. CATCH is a one-piece molded feeder for cats and small pets. CATCH is made in hard phthalate-free plastic with four anti-slippery feet. CATCH weighs 476 grams and measuring 27 x 23 x 8 cm. CATCH consists of 37 purple spikes – all of them between 2 and 6 cm in hight and all of them smoothly rounded. CATCH has an outer edge allowing wet food and approx. 0.3 liter of water. CATCH was released world wide at the Bologna pet fair ZOOMARK in May 2013.